Can American Science & Engineering Beat These Numbers? 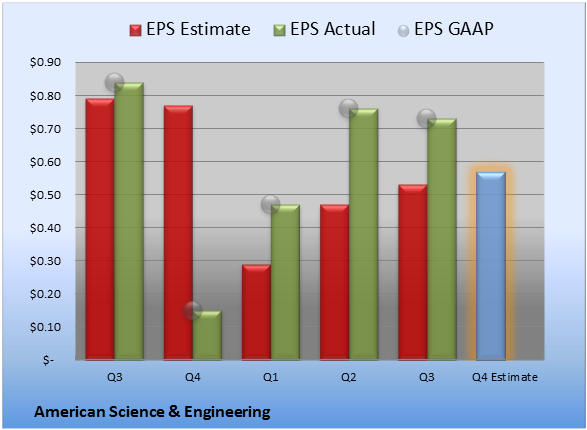 Comparing the upcoming quarter to the prior-year quarter, average analyst estimates predict American Science & Engineering's revenues will grow 27.4% and EPS will expand 280.0%. The average estimate for revenue is $50.7 million. On the bottom line, the average EPS estimate is $0.57. 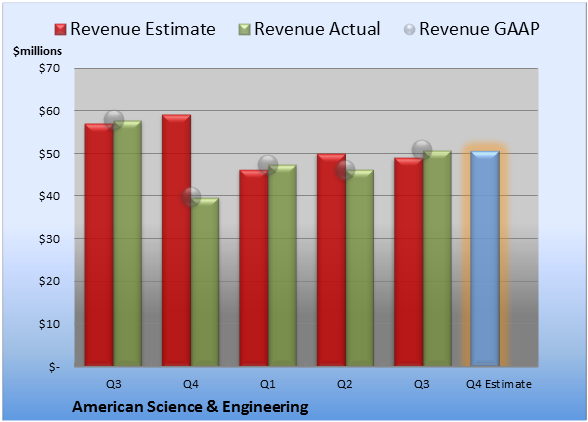 Last quarter, American Science & Engineering tallied revenue of $50.8 million. GAAP reported sales were 12% lower than the prior-year quarter's $57.9 million. Last quarter, EPS came in at $0.73. GAAP EPS of $0.73 for Q3 were 13% lower than the prior-year quarter's $0.84 per share. For the preceding quarter, gross margin was 44.7%, 100 basis points worse than the prior-year quarter. Operating margin was 18.1%, 130 basis points worse than the prior-year quarter. Net margin was 12.0%, 100 basis points worse than the prior-year quarter. The full year's average estimate for revenue is $195.0 million. The average EPS estimate is $2.53. The stock has a five-star rating (out of five) at Motley Fool CAPS, with 963 members out of 991 rating the stock outperform, and 28 members rating it underperform. Among 267 CAPS All-Star picks (recommendations by the highest-ranked CAPS members), 263 give American Science & Engineering a green thumbs-up, and four give it a red thumbs-down. Of Wall Street recommendations tracked by S&P Capital IQ, the average opinion on American Science & Engineering is hold, with an average price target of $63.40. Can your portfolio provide you with enough income to last through retirement? You'll need more than American Science & Engineering. Learn how to maximize your investment income and "Secure Your Future With 9 Rock-Solid Dividend Stocks." Click here for instant access to this free report. Add American Science & Engineering to My Watchlist. Is American Science & Engineering Stock Selling Out Too Cheaply? American Science & Engineering Stock: Is It a Cash Monster?